A common issue with label printer applicator performance is the label and ribbon stock used in the machines. Poor stock can result in poor readability on the labels themselves, damaged printheads and platen rollers that wear out too readily. When a substantial investment is made on equipment it only stands to reason that you want to take care of that equipment. The best way to do that is to only use stock that is designed to be used in label printer applicators. Thermal Transfer labels provide a longer readable life than direct thermal labels and typically do not fade with time or heat. 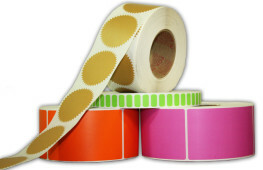 A thermal transfer ribbon is required to print the labels. Generally, the cost of ribbons plus standard thermal transfer labels is similar to the cost of standard direct thermal labels on their own. Thermal transfer labels are usually suggested for printing applications in which the label is required to have a longer life, it is exposed to extreme temperatures or conditions or is typically left on the shelf for extended periods of time. FOX IV’s knowledgeable label staff can help you choose a combination of thermal transfer material and ribbon depending on the quality of printing required and, of course, your budget. 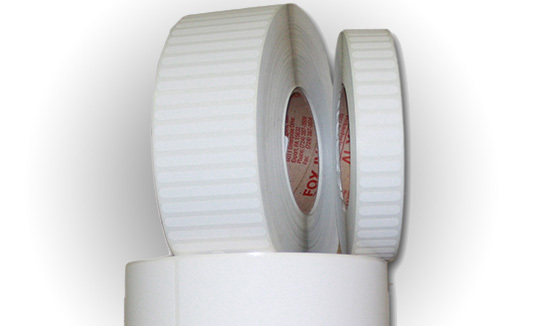 FOX IV supplies a wide variety of label sizes in rolls, fan-folded, pin-fed or sheeted. We also offer synthetic label stocks including polyester, polypropylene, polystyrene, Kimdura and Valeron. Additionally, blank stocks can be flood coated for colored label applications. Direct thermal label stock changes color when heated, eliminating the need for a thermal transfer ribbon and creating an economic solution for many shipping labels. Because another heat source can affect the image and it may fade over time, direct thermal labels are usually suggested for printing applications in which the label stock is not required to last an extended period of time, is not exposed to extreme temperatures or conditions and labels are typically not left on the shelf for long periods of time. Direct thermal labels can help to prolong printhead life by allowing application with lower print temperatures and less-abrasive paper stock. 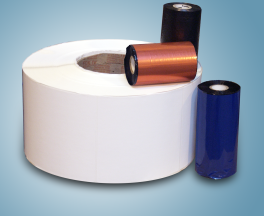 FOX IV supplies a wide variety of label sizes in rolls, fan-folded, pin-fed or sheeted. We also offer synthetic direct-thermal label stocks including polyester, polypropylene, polystyrene, Kimdura and Valeron. Our Label Experts can help match the correct stocks and adhesives to create a label that meets your application requirements.